For a variety of reasons, discussed in another section of vauxpedia, the Vauxhall 20 & 27hp BY BX & BXL models were not a sales success and for a Company that loudly proclaimed “Engineering Leadership” they did not really cut the mustard; although to be fair they did offer a lot of motor car for the money compared to rivals. However, Vauxhall were undaunted and started making plans for a new aspirational, top of the range model, that would be completely designed and engineered to appeal to British & European tastes as perceived by Vauxhalls own product planners. The new car would also mark the end of an era for Vauxhall in several ways; it would be the last Luton production car to use a separate chassis, apart from some J, L & E Series variations locally assembled by Holden in Australia, the last truly large car built by the Company for many years and the final model to offer a variety of coach built bodywork which in turn would have an adverse impact on companies like Grosvenor for whom Vauxhall accounted for a large part of their business. It was also the first car on which David Jones was involved with the exterior styling from initial conception, although it would be another two years before he would oversee Vauxhalls Design Department. Jones had joined Vauxhall in January 1934 from the Royal College of Arts to earn enough money for a family holiday in France, after spending eighteen months on secondment to the GM Design Studios in Detroit working under Harley Earl he came back to Vauxhall at Luton and ended up becoming the longest serving head of an automotive design department of any motor manufacturer in history – a record that still stands to this day. The engineering work on the GY GL models started with the chassis design early in 1935 and, as with the BY BX & BXL cars, it would be available as a standard 111ins & 130ins long wheelbase options. Despite being the same dimensions previously used the chassis was completely new and was of deep skirted cruciform construction with five “X” bracings compared to the more normal “ladder”, the reason for keeping the same size choice was in order for Vauxhalls regular outside coachbuilders to use their existing bodies with a minimum of alteration. The new chassis featured two major advances for Vauxhall, the first was a return to hydraulic brakes. Vauxhall were among the first British manufacturers to fit hydraulics instead of cables but the results were less than successful and the Company had reverted to rudimentary cable operation which, if nothing else, was at least proven to be reliable in service. However, in the intervening years companies such as Lockheed had refined the technicalities of hydraulic brake systems to the point where Vauxhall were persuaded that the advantages were worth the risk, but to minimize those risks they chose to use an advanced dual circuit system which also helped to appease the detractors within Vauxhall like the head of Commercial Vehicle Engineering; Stepney Acres. The Lockheed system fitted to the GY GL cars split the drum braking into a front and a rear operation with a cable operated handbrake working on the rear drums only, the drums themselves were made from chromidium iron. Independent front suspension had been pioneered by Vauxhall in Britain with the successful application of the patented Dubonnet system used on the Light Six DX DY models launched in October 1934. The new GY GL 25hp chassis was specifically designed from the outset to use independent front suspension, however, instead of using an identical arrangement to the Light Six a modified set up was employed for the 25hp which had been developed following in-service experience with the Light Six models. A substantial 3ins diameter steel tube was bolted across the front end of the chassis frame and provided support for the steering swivels and acted as an additional cross member. Hinged to each swivel was a sealed container, the rear end of which housed bearings for a sleeve supporting a radius arm which carried the front wheel. To withstand the loads carried by the front wheels a torsion bar & torsion tube were used, hence the name “TT”. One end was secured to the radius arm & the other secured to the tube, in turn the opposite end of the tube was flanged & bolted to the casing therefore negating the need for a much longer bar. 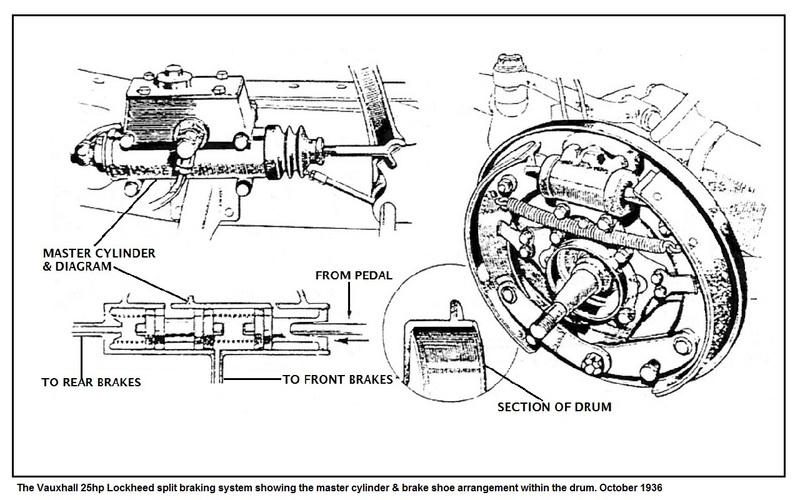 The direct action of the torsional suspension was regulated by a mounting on the sleeve attached to the radius arm with a toggle lever loaded at the “free” end by the pressure of a stiff coil spring. Under normal running conditions the lever & coil spring were in line and had no effect on the suspension. If the wheel met an obstruction the lever would become tilted and assisted the wheel to twist the torsion members. The result was a softening of the suspension for riding over small bumps. If the movement became greater the pressure of the coil spring diminished so that, despite the increased leverage, the net torsional effect produced by the spring dropped to zero. As a result, the full resistance of the torsion members would be exerted and the suspension stiffened against undue motion. 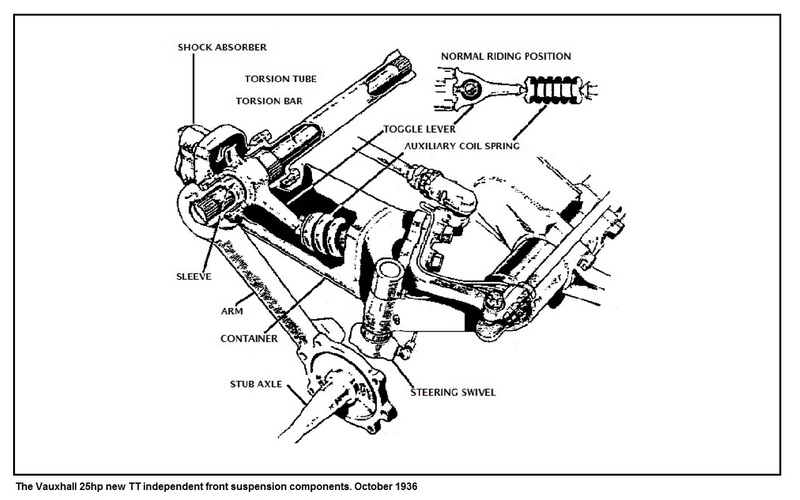 The use of the new TT suspension also gave Vauxhall engineers the opportunity to mount the whole Marles cam & roller steering gear directly on the chassis frame meaning it would be unaffected by suspension movements. The steering ratio was also lower, at 15.5:1, than the BY BX & BXL models. Compared to the front suspension, the arrangement at the rear of the GY GL 25hp was a bit of an anti-climax. Conventional, 54.5ins semi-elliptic leaf springs with a torsion bar acting as an anti-roll bar were fitted, the front end of each spring was fitted with a Silentbloc bush with screwed shackles at the rear end. Vauxhall specification hydraulic shock absorbers were fitted all round. By the mid-1930s any car with an engine over 3litres was generally considered an extravagance in terms of fuel consumption and, normally, the purchase price. However, Vauxhall were confident that they could build a large car with an extremely flexible 3litre engine combined with high gearing thereby giving better than average fuel consumption and sell it at a price that was still within reach of a “normal” motorist. The 3180cc engine used in the 27hp Light Six had proven to be reliable in service and was also extensively proven in many Bedford commercial vehicles. 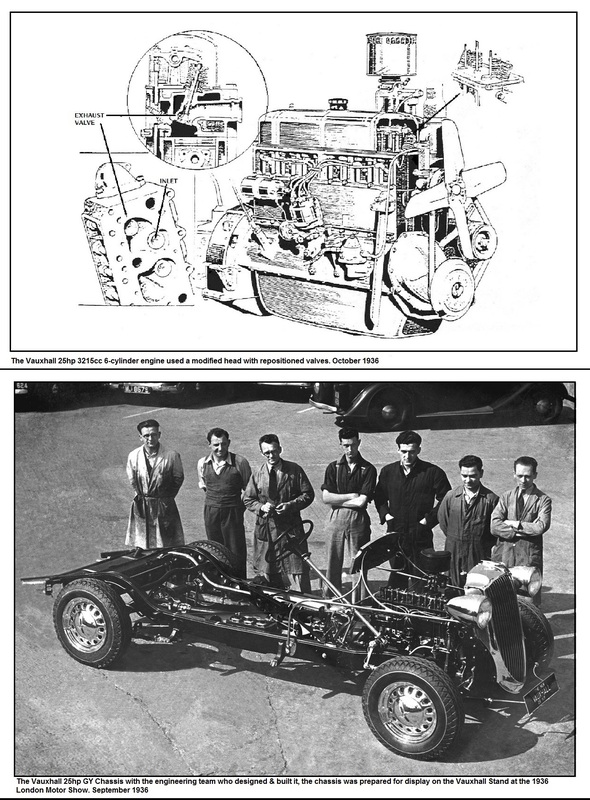 To achieve the maximum possible flexibility the engine underwent extensive dimensional changes using the longest possible piston stroke which was increased from 95.25mm to 101.6mm, but by reducing the bore from 84.14 to 81.94mm the total capacity was increased to 3125cc but the peculiar British car taxation system meant instead of a 27hp it was classified as a 25hp car. Careful development was carried out on the cylinder head & valve positions, the inlet valves were almost vertical and were located in a shallow extension of the combustion chamber whilst the exhaust valves were angled at the top of the compact combustion chamber. These changes optimized power, torque & fuel consumption whilst supressing pre-detonation which enabled the compression ratio to be raised from 5.6:1 to 6.0:1. Immediately beneath the Zenith downdraught carburettor, the inlet manifold was fitted with an internal jacket which allowed exhaust gases to circulate when the engine was cold and, by means of a thermostatically controlled flap, closes when the engine reached its normal operating temperature. The carburettor was fitted with a special mixture control using a spring-loaded valve operated by vacuum suction from the inlet manifold which automatically weakened the mixture when a light throttle opening was being used. These changes combined to give spectacular results, the low revving engine produced 80bhp@3600rpm with a very flat torque & power curve and outstanding flexibility which meant the final drive ratio could be raised to 4.44:1, very high compared to rivals at the time. The 4-speed “silent 3rd” transmission with synchromesh 3rd & 4th was carried over from the BY BX & BXL unchanged. Unfortunately, what wasn’t carried over was the electric wipers which changed to the dreaded mechanically operated items, a feature that would become as unwelcome as a turd in a swimming pool and plague Vauxhalls for the next two decades. The Pedomatic starter was retained but changed from the accelerator to the clutch pedal and the dubious dipping arrangement of the front headlights was continued in the new car. Wheels were smart pressed steel with chrome centre caps and were now 16ins instead of 17ins and wore wider 6.25ins tyres. Styling for the new GY GL 25hp moved away from the rather chintzy look of The Light Six and was a more sober (British?) looking car but one that was also neat, modern & attractive. The slanted full height front waterfall grille blended in with the sculptured front wings to give an almost imposing impression while at the rear a pronounced boot balanced the overall appearance and was also bigger & more flexible than before. Inside there were less substantial changes, a new adjustable steering wheel was standard, the trim a little less ornate but still very luxurious & comfortable, even rear passenger foot rests were included. The instruments were slightly less ghastly than the Light Six but Vauxhall still didn’t show any pictures of it in the 25hp publicity. The new Vauxhall 25 was publicly launched in October 1936 at the London Motor Show for the 1937 model year with prices starting at just £298 for the 5 Seat Saloon and represented incredible value for money that was unmatched by any rivals at the time. The car was capable of 80mph flat out but would pull away in top gear from as little as 10mph and yet could still give owners over 20mpg without trying too hard. Unfortunately, Vauxhalls marketing department did try too hard and made claims that the new 25 was a modern equivalent of the 30/98 – if ever there was a clear case for having an advertising standards authority! Independent front suspension was a major selling point and for the most part was a success providing it was set up properly and lubricated when required gave a smooth ride that was top of its class but it didn’t make a very strong case for handling & road holding which, for an 80mph car, were only just about adequate. 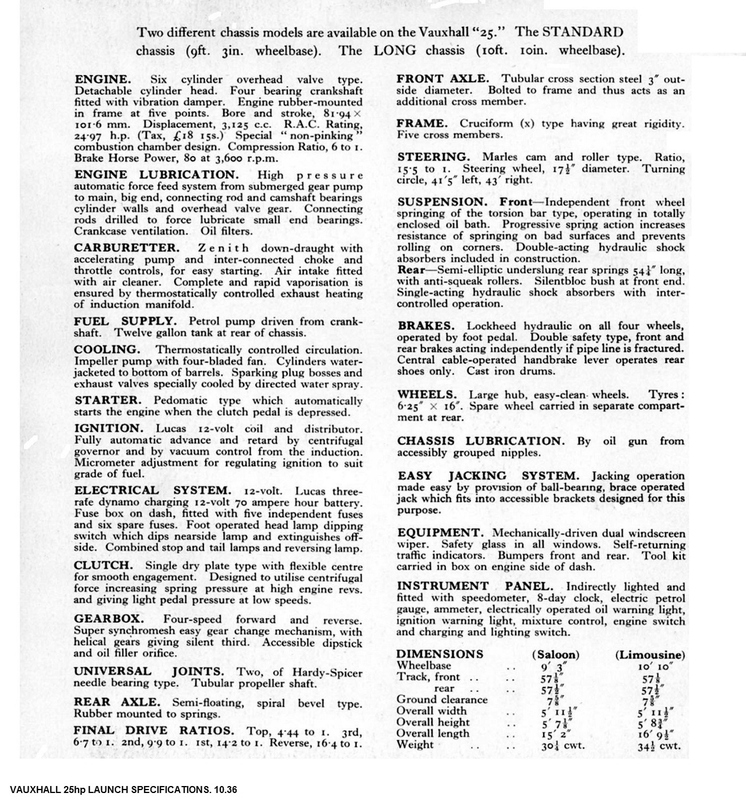 Vauxhall approved coach built bodies included; A Wingham Cabriolet from Martin Walter for £400, the Grosvenor 7 Seat Limousine at £575 & a Closed-Coupled Sports Saloon for £345, a Continental Touring Saloon by Connaught for £498 and finally a Tickford Foursome Coupe by Salmons for £365 which was taken over and offered by Grosvenor in 1939. Most of these looked the same as before save for the new wheels, bonnet & front end. 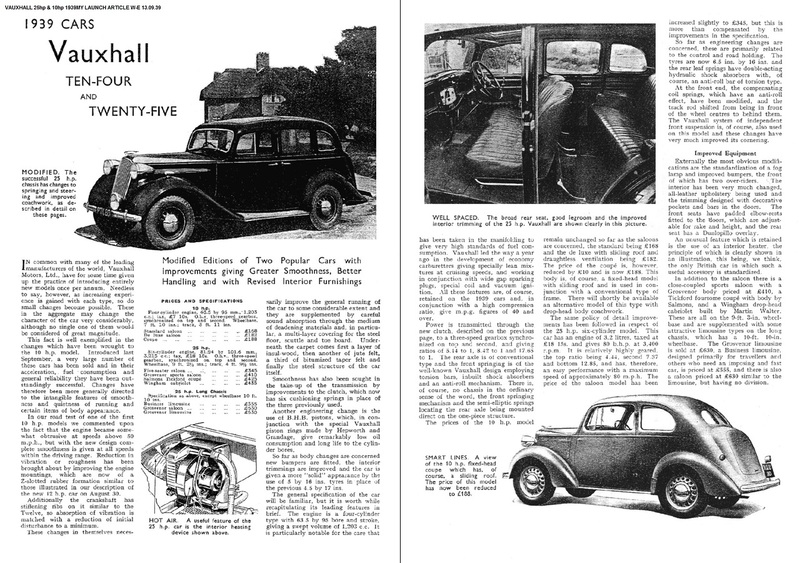 Vauxhall continued to develop the GY GL 25 and announced in October 1937, for the 1938 model year, another first in class for the 25; an ALL synchromesh gearbox, the down side was that it had 3 instead of 4-speeds. The 25 became the first British car to be fitted with a built-in heater & demister as standard. Twin wind tone horns were added whilst the Pedomatic starter was replaced by a hand operated starter button on the dashboard. Silentbloc rubber bushes were fitted to all rear spring shackles and were enclosed in articulated metal gaiters to retain lubricant & exclude wet and moisture. The price for the 5 Seat Saloon increased to £315. For the 1939 model-year the front suspension calibration was adjusted and the rear springs were made more flexible, double acting shock absorbers replaced the single action previously used. Slightly larger section tyres were fitted and the steering tie-rods were moved from the front of the forward axle to behind it to improve tyre wear. New larger, stronger bumpers with over riders and new 25 badge on the front, new style door handles were also fitted. Inside there was new improved trim & revised front seating with chrome runners, a completely new rear seat design, new adjustable door arm rests, new assist cords and larger door map pockets. Burr walnut door cappings replaced the body colour metal. The 25 5 Seat Saloon was renamed - The 25 Luxury Saloon and the price increased to £345. There were no further developments to the GY GL 25 models until production was halted early in 1940 because of World War II. The total sales of 6,822 was 67.2% up on the previous BY BX & BXL models over a shorter production run and proved Vauxhall managements sound judgement as to what motorists wanted and the car enhanced the Company’s reputation for building cars that were class leading, carefully engineered and offered exceptional value for money. 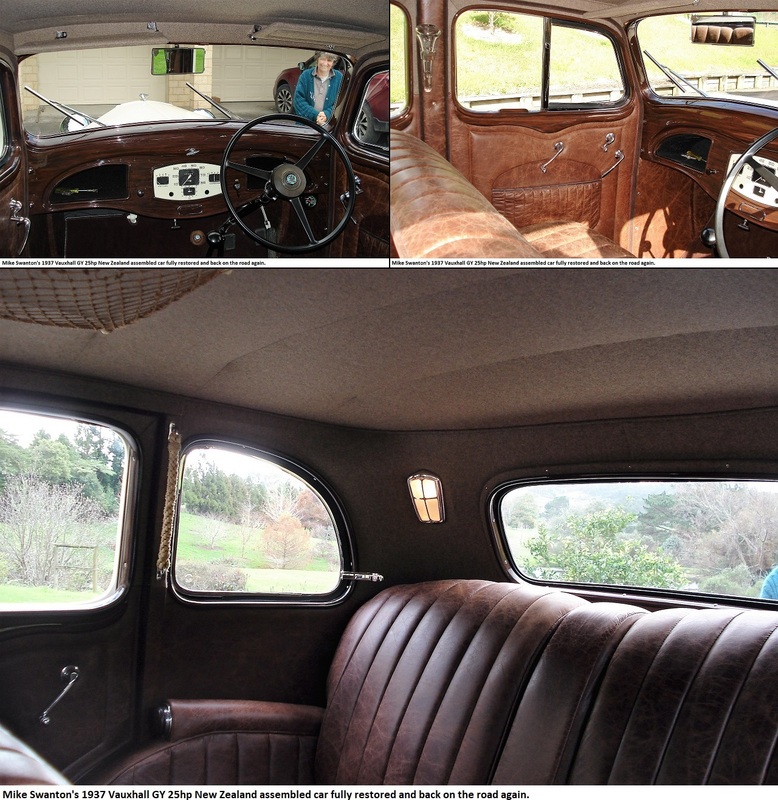 Mike Swanton is a Vauxhall enthusiast living in New Zealand and in 2015 completed the restoration of an Australian assembled 1937 Vauxhall GY 25hp. It was a complete & authentic restoration and Mike named the car Valerie. 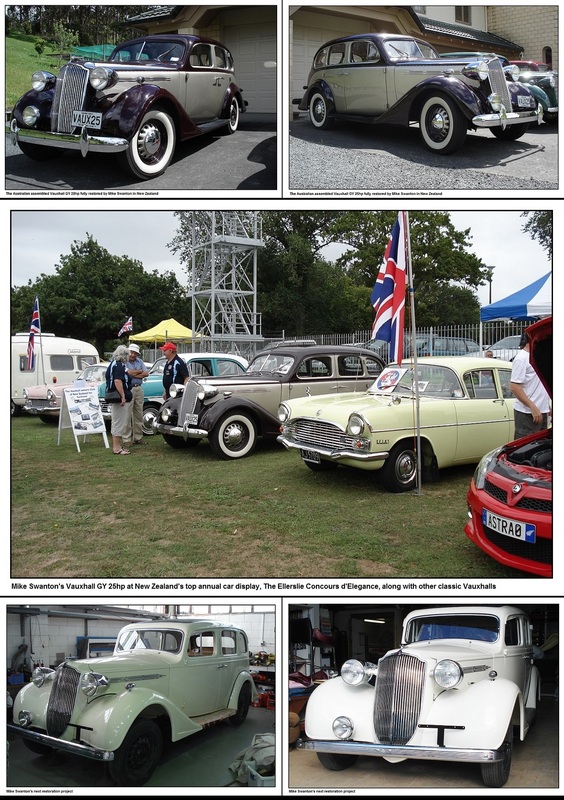 There are two pictures of the car and one of her at New Zealand's top annual car display (The Ellerslie Concours d'Elegance) along with other Vauxhalls. Valeriee won the overall Gary McCrystal Memorial Trophy, much to the delight of Mike. 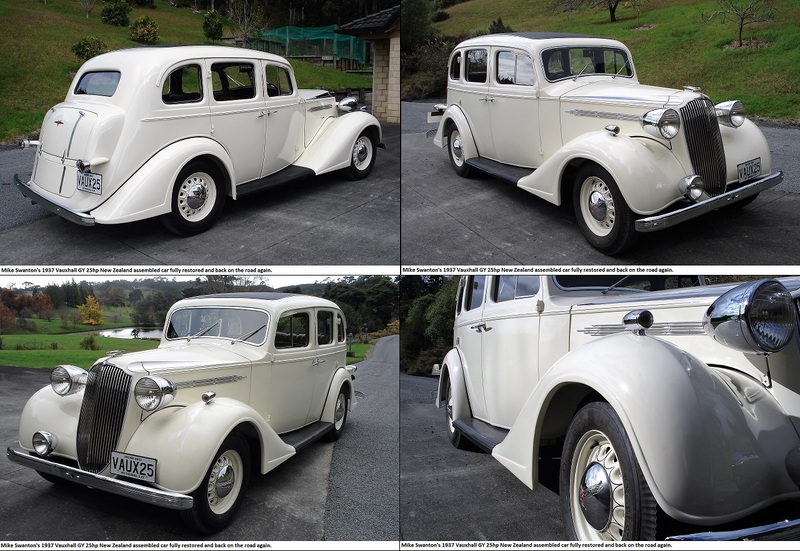 The car was assembled from a Vauxhall CKD pack by Holden and is a rare sight in New Zealand. Photographs of Mike's next restoration project are at the bottom.